When I reviewed Acorn 1.0.2 ( ) back in October of 2007, I was pleasantly surprised at its capabilities, but wanted a bit more from some of its features, such as better text tools and improved performance. While not designed as a professional-grade image editor, Acorn nonetheless offers an array of editing tools for photography hobbyists and bloggers. And, it’s easy on the pocketbook. Flying Meat has now released Acorn 2.1, and I am pleased at how fast this version runs on my 13-inch MacBook Pro 2.53GHz with 4GB of RAM. Opening, saving, and editing images in the 30MB range was mostly fluid, due in part to the program’s new 64-bit support. The current Acorn program fixes most of the problems I had with the previous version, such as a finicky Text tool, and introduces a much-improved user interface as well as many new features. These include rulers, Raw support, a host of new tools and filters such as Render Clouds, and the ability to group layers. Other new or improved features include a custom brush designer, vector shapes, improved selection tools, iSight image capture, and Web Export capability—Acorn allows you to save your image as a JPEG, GIF, or PNG while previewing the results side-by-side with the original. Save options also include familiar formats such as TIFF, BMP, and Acorn's own proprietary file format. The only thing I found lacking is the ability to save a layered screenshot as a PSD file; but with plenty of image-editing capability built in to the new version, it's not really necessary to export anything into Photoshop. By far the most interesting new feature is the program's screen-capture capability. A quick keyboard shortcut immediately opens your screen shot in Acorn; and this is where the magic happens. 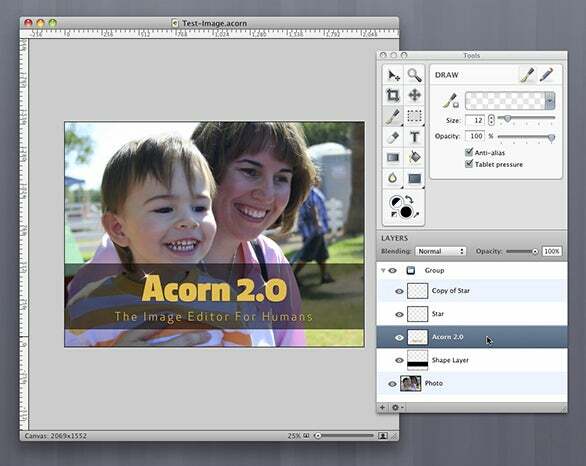 Acorn saves individual elements of your screen shot on different layers. For example, the Dock appears on its own layer, as do menu bar app icons, application and Finder windows, and application palettes—all named appropriately so it's easy to turn off the visibility of elements you don’t want in your image. Layers introduced this concept first, but Acorn gives the benefit of being able to further edit your screen shot without first saving it as a PSD and opening it in Photoshop, which saves valuable time. Anyone who takes a lot of screen shots for their blog or technical manuals will absolutely love this feature. Acorn 2.1 also brings fairly extensive AppleScript and improved JSTalk support to the app. While this isn't a feature that will appeal to most users, those with a bit of "geek" in them will welcome the addition. Several helpful example scripts are available for download from the Acorn Web site to get you started. Acorn 2 features an improved interface, allowing you to focus on your image, rather than on palettes. Acorn 2.1 is a great app for digital photography hobbyists, bloggers, or anyone who needs a decent amount of flexibility in editing images but doesn't require the power of a full image editor such as Photoshop ( ) or Pixelmator ( ). The only thing that gave me reason to pause was the price. Initially, the $50 price tag appeared somewhat high, and led me to compare Acorn to Pixelmator, a much more in-depth image editor that's priced at $59. But the layered screen-capture feature, and the app's simplicity and power make Acorn worth the price. Acorn 2.1 packs a lot in a small space, and will satisfy most consumer-level Mac users' need for image editing without the complexity and learning curve of more full-featured applications.